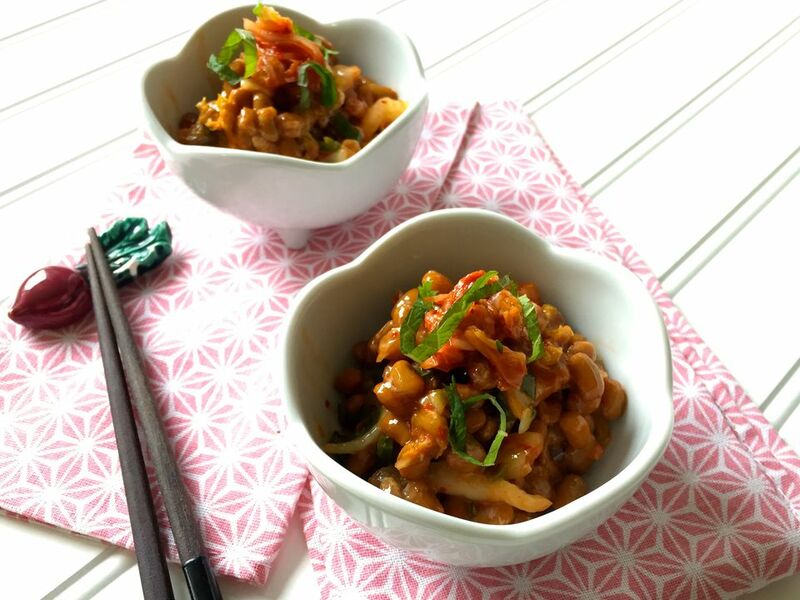 Spicy kimchi natto (fermented soy beans) is a quick and easy Japanese fusion side dish or appetizer, that can be added to your weeknight meal, or enjoyed as a snack with rice. Kimchi is a Korean dish of spicy pickled nappa cabbage, and is available for sale at many Asian grocery stores, and also in some American supermarkets as well. It can also be made at home. Although kimchi is a uniquely Korean dish, it is also enjoyed in Japan in a number of fusion or modern dishes, for example, ramen, fried rice, okonomiyaki (savory pancakes) or eggs. With the rise in popularity of kimchi, it is not uncommon to see kimchi and dishes that incorporate kimchi on the menus of Japanese bars or tapas-style restaurants. Chop kimchi pickles into small bite-sized pieces. In a small bowl, combine packaged natto with the seasoning packets, or "tare" that it came with. If no sauce is included with the packaged natto, drizzle a touch of soy sauce, or seasoned "dashi" soy sauce over the natto. Mix in chopped kimchi pickles with the natto. Stir well. Wash and pat dry shiso (green perilla leaves). Stack the leaves and roll them together, then slice into thin strips (chiffonade). Add 3/4 of the shiso chiffonade to the natto and kimchi mixture. Gently stir. Serve kimchi natto mixture in small bowls, then garnish with remaining pieces of shiso.